Halloween does not necessarily prompt thoughts of bad tax policy, but in honor of the season, we thought we would take a light-hearted (but still serious) look at some potentially frightening developments in the state and local tax world. The State of Illinois and its many units of local governments are almost all struggling financially. Spending has outpaced revenue at nearly every level of government for years (a true horror story), and that mis-match can be a formula for trouble, as politicians and tax administrators are tempted to stray from the fundamentals of sound tax policy in search of an easy fix. Here is our list of bad ideas—scary tax things—that keep us up at night. Vigilantes, although not the gun-toting, swashbuckling sort. A new term has crept into conversations about taxes in Illinois recently: “vigilante tax administration.” The phrase has been used to refer to private attorneys misusing the state’s False Claims Act and to bounty-hunter firms hired to audit taxpayers on a contingency fee basis. Both practices interfere with the proper administration of taxes. The Government’s interest, when it is administering tax laws, is to collect the correct amount of tax. No more, and no less. The vigilantes, however, are acting in pursuit of their own financial best interests, which are maximized when the taxes assessed or collected are maximized. In other words, they want taxpayers to pay, and pay a lot, whether they owe tax or not. These private firms also do not have the institutional culture of protecting taxpayer confidentiality that is (or at least should be) part of governmental DNA, so allowing them access to that information raises a whole host of additional concerns. Pyramids (with or without creepy mummies). There has been a lot of talk about broadening Illinois’ sales tax base. Generally speaking, a broad-based tax is a good tax, which is why—generally speaking—TFI does not in principle oppose imposing sales tax on services. But that’s only true if the base-broadening is done properly. Taxing business inputs leads to layers of taxation on the same end-product (good or service), often called “tax pyramiding.” For example, when a store sells a bag of Halloween candy, tax is due, but to avoid pyramiding there are tax exemptions available when the store buys the candy from the distributor, or the distributor from the factory, or when the various ingredients are purchased on up the line. Without those exemptions, tax added on each step in the chain of transactions would be baked into the cost at the next step, effectively piling tax on top of tax—a pyramid. Sales taxes are supposed to be taxes on final, retail-level consumption only, and any expansion of our tax base to services should follow that guiding principle. In fact, our existing sales tax structure should be revised to more completely exempt business inputs from tax, to minimize the pyramiding. Candy-haters, or, more accurately, a special tax on candy. Any tax targeting a specific product (like candy or soft drinks) or industry (like banks or other financial organizations) is a bad idea. The tax code should treat all taxpayers (or taxable items) the same, and should not pick winners and losers. The resulting economic distortion is the exact opposite of good tax policy. These proposed targeted taxes are often touted as a way to fund a particular program or service; if it’s worth doing, the funding should come from broadly-applicable taxes. Giants. Gigantic, monstrously complicated tax codes are costly to comply with, costly to administer, and can lead to a lack of taxpayer confidence in the tax’s fairness. Simplicity is a hallmark of good taxation. For example, one great advantage of Illinois’ income tax is that, by and large and compared to many other states, it is fairly simple. We start with federal taxable income or adjusted gross income and require only a few adjustments. Unnecessary decoupling from the federal tax code takes us closer to a needlessly cumbersome giant of a tax code. On the other hand, our State’s sales tax system—really a whole host of several dozen interrelated state and local taxes—has already become quite the unwieldy giant. Good tax policy suggests we should take a long and hard look at reforming and simplifying and lopping a few heads off this Hydra. Costumes. When elected officials believe that a tax increase is necessary, they should be up-front about it and call it a tax increase, rather than placing a crown on its head and disguising it in a princess costume. Putting a misleading but friendlier label on something, calling it a “reform” or worse yet a “loophole-closer,” isn’t fair to the voters and taxpayers when in reality the measure is a poorly-disguised tax increase. Just as disturbing, something labeled as a tax break might not be one at all—yet another disguise. For example, property tax “exemptions” don’t reduce the amount of property tax a government gets—they just shift the tax burden around from one property owner to another, and make everyone’s rates go up. [See Examining the Effects of Increased Homestead Exemptions, in the April 2017 Tax Facts.] Masks might be fun at Halloween, but a good tax is transparent—taxpayers know what they’re paying, and understand the real consequences of proposed changes. Creepy things. More specifically, creeping split roll property tax. “Split roll” means different types of properties pay tax under different rules, rates, etc. The Cook County classification system, for example, shifts taxes from homeowners onto businesses without actually decreasing total taxes. Throughout the state, homestead exemptions do the same thing, although to a lesser extent. This breaks the direct connection between property values and taxes paid, and reduces accountability at the local government level. Illinois should resist allowing this particular bad idea from creeping any farther. The undead. Like people, laws (including tax laws) have a natural lifespan—a beginning and an end. When a new law or regulation is passed or adopted, or when one is repealed, it should not reach back in time. Tax laws and regulations in place at the time of a particular transaction should govern that transaction (or tax year). [See Retroactivity in State Tax Legislation, in the February 2018 Tax Facts.] Imposing a change retroactively disrupts the natural order and should be avoided like the plague. And zombies. (Copy)Cats. A black cat crossing your path may bring bad luck, but blindly copying a tax proposal from another state can be equally perilous. Each state’s overall tax structure is different, and although uniformity can be a good thing in many state tax contexts, not every trend from Montana, Indiana, or Florida is a good idea in Illinois. Recent examples of this scary thing: tax haven legislation (measures designed to catch federal “tax cheats” through outdated blacklists and which are unnecessary given Illinois’ existing anti-abuse laws) and broad tax return disclosure proposals (which violate taxpayer confidentiality and do little more than feed the vigilantes, above). Tricks disguised as Treats. We like Halloween treats as much as anyone else – our personal favorites are popcorn balls and caramel apples – but when it comes to tax policy, too often tricks masquerade as treats, particularly in election years. Vague promises of increased spending on favored programs to be funded by a tax somebody else pays are often as hollow as a jack-o-lantern. Similarly, promises to cut taxes without identifying programs where spending will be cut are as stale as last year’s bubble gum. Now a candidate who made specific proposals– that would be a welcome treat. 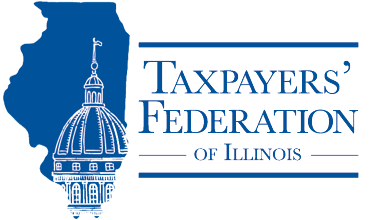 President of the Taxpayers’ Federation of Illinois since January 2013, Carol Portman has been working in the state and local tax arena for over two decades.